People would voluntarily stay home. Rather than allocating gas to people with time on their hands to wait in line, gas would go to people who are really busy. People would voluntarily form carpools. Better, they would advertise for paying carpool mates on Craigslist, and the minivan owner running it would be able to get gas. People who have emergencies, like wife needing to go to the hospital to deliver a baby, could get gas to do so. Gas stations would have bought generators, so they could pump and sell gas at a big profit when the power goes out. People who don't have to go anywhere would siphon their gas and sell it neighbors. Or second-car gas. They'd siphon their lawnmowers too. People would rent tanker trucks, drive around the northeast, buy gas and resell it in NY. Actually, people might get a bunch of gas cans and drive the gas in from rural areas in the back of pickups. Not sure if this is a good idea, especially for smokers, but it would improve gas supplies. Exxon would have spent the money for more storage tanks in NJ, ready to sell gas at high prices in an emergency. The reason I bring this up in a blog post is because Cochrane's list is -- by and large -- a very good and standard summary of the likely effects of price gouging laws, except for the statements in bold. The reason is that price gouging laws do not guarantee a lower effective price of obtaining gasoline, a fact that contrary to popular intuition. In fact, because price gouging laws discourage the voluntary supply of gasoline, we could expect a higher equilibrium effective price of gasoline (including the monetary price and opportunity cost /hassle of waiting in line or gaming the system) under price gouging than under no price gouging. If this is the case, you would expect that more people would voluntarily stay home under price gouging, not less, and more people advertising for carpools on Craigslist, not less. 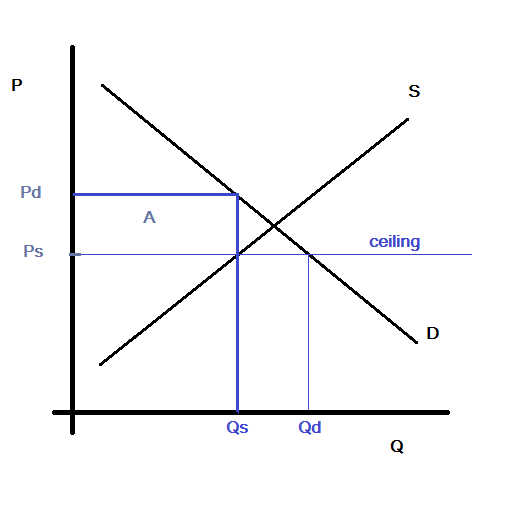 There is a sense in which a simple supply and demand diagram illustrates this intuition, and I wrote about this before. Under price gouging laws (plus strict no black market enforcement), only the gasoline willingly brought to market by producers at price Ps will be traded (that is, Qs will be traded even though consumers want Qd). As I discussed in my previous post on price caps, we shouldn't stop by saying that Qd>Qs if we hope to understand what happens when there is a shortage. Threatened with a shortage, consumers will bid for the gasoline by showing up earlier or by side deals or some other unforeseen mechanism. Regardless, these bids have costs, which should be accounted for in the full notion of the price. How much in these ancillary resources will people bid? That's a somewhat complicated question, but if you assume that no one has a comparative advantage non-price bidding (and no black market, so Qs is all that is supplied), the marginal non-price bid will be Pd - Ps, so that the full price is Pd. The main point is that price gouging can make the effective price higher. 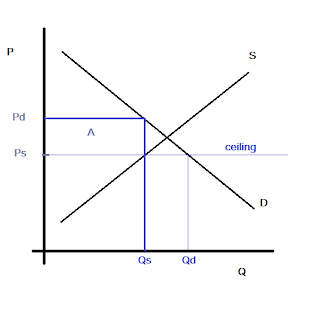 Higher still than the equilibrium price if price gouging laws were not put into place. In response, it is possible that more people will stay home. There is a lot more to allocating resources in a market when the government imposes price caps. Black markets are important. On the supply side, bundling of related services can be important too: $50 car washes with a free tank of gas (or should it be $100? ), but that's the topic of another post. For an excellent perspective on this, check out A Theory of Rationing by Waiting by Yoram Barzel.